Every day, Watch This offers staff recommendations inspired by a new movie coming out that week. This week: Before setting sail for The Finest Hours, check out these classics set mostly at sea. With no battles and a setting that primarily stays on the U.S.S. Reluctant, Mister Roberts still captivates, aided by some shimmering dialogue already polished to perfection by the Broadway version, along with the renegade hijinks of the crew. 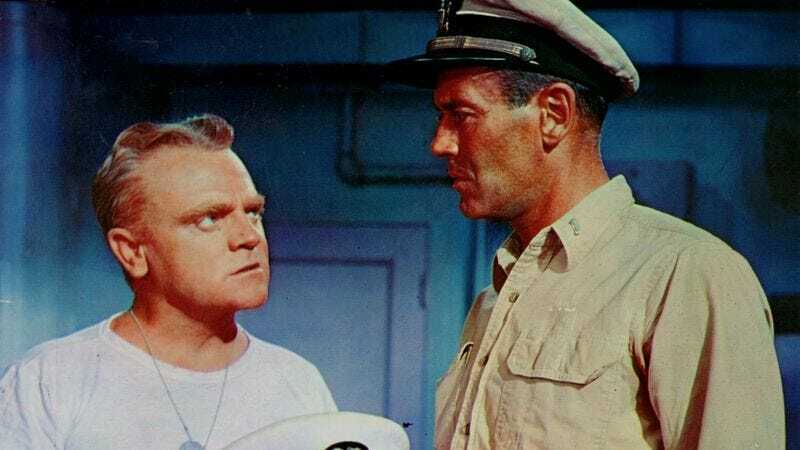 The night they get liberty in a Polynesian port after a year is a symphony of depravity; a young Martin Milner plays the MP who lists the crew’s nefarious acts with a healthy degree of admiration. The movie’s also anchored by a string of powerhouse performances, including William Powell’s last screen appearance as “Doc,” and James Cagney, who’s simultaneously terrifying and hilarious as the commanding officer in love with a potted palm tree. Fonda had won a Tony for playing the role on Broadway and unexpectedly clashed with his frequent collaborator, director John Ford, as they disagreed over the interpretation of the lead. Their fight and friendship ended when Ford sucker-punched Fonda in a meeting studio execs scheduled to help air their differences, and left the movie. Ford bounced back the following year with The Searchers, but Fonda only appeared in one more Ford film, 1962’s How The West Was Won. Among this crowd of impressive (and hot-headed) veterans, newcomer Jack Lemmon stood out enough to win his first Oscar as the depraved Ensign Pulver, who eventually graduates from his adolescent hijinks to become someone of respect. His transition is astonishing, but as Doc says at one point, you never know what kind of person you’ll be when you go to war. It isn’t until Roberts finally gets into battle that he realizes the bravest men he knew were on that cargo boat, battling neverending tedium with courage, creativity, and a love of life that couldn’t even be snuffed out by wartime. Availability: Mister Roberts is available on DVD from Netflix and possibly your local video store/library. It can also be rented or purchased from the major digital services.